Normally you would take your AR15 on a shooting range regardless of the weather to improve your shooting. And especially when you hunt with your friends with your AR15s during the hunting season, you take a lot of ammos and other accessories with your rifles. In these scenarios, what you’ll always need is the best AR15 soft case to complete your arms cargo. But why the soft cases and not the hard ones which are more solid? And why the need for a gun case when you can actually keep your rifle inside your vehicle and stuff your ammos and other paraphernalia on a backpack? Well, for one thing, a case won’t indiscriminately show people you are carrying a gun in your car. Even if it’s licensed which always should be, a civilian’s gun should always be kept concealed from the eyes of the public. 1 So why the soft case? So why the soft case? The better choice could be the soft case because these are lighter, also generally padded and have lots of pockets to put everything you need. So essentially your rifle and your stuff are all protected in one soft carrying case that’s not too bulky, lighter and offers a lot of rooms. Soft cases for the AR15 are actually more popular than the hard cases. But how can you pick the right one? We are not suggesting leather-made soft cases for AR15s because majority of these are expensive. But at least choose a case that’s solidly made or made from tough fabric materials like nylon, with double stitches and waterproof. If you want to preserve the handsome look of your AR15 and don’t want to even get it scratched or if you need to protect its expensive optics attached to it then the best AR15 soft case with an excellent padding would be a good choice. You definitely need a lot of these to keep your ammo magazines, extra scopes and other paraphernalia such as your ear protection gear, gloves, protective glasses and so on. Zippered or velcroed pouches for more secured hold that will not let your accessories to fall out no matter how you carry your case are also good considerations. You may need to sling your soft case on your shoulder during hiking or hand carry it for target shooting so its strap and handles must be tough, comfortable and of best quality. 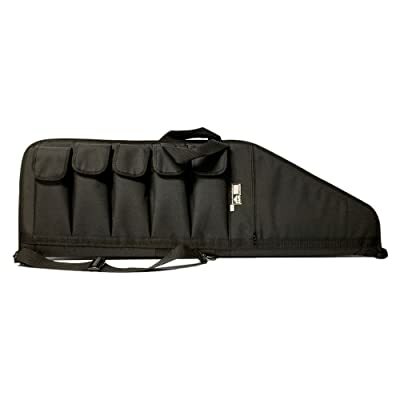 Of course your soft case needs to be spacious to accommodate the things you need other than your rifle. Remember that once you stuff the pockets with lots of things, your rifle’s space may lose some room. Don’t forget the length as well as it should be long enough to secure your long rifle. This is to avoid breaking off the strap from the case when your case gets filled up with a heavy gun and some accessories while carrying it. Metal swivel hooks are the best and they won’t bend, break and can take the beating even you carry your case roughly during hunting. Or hard, solid plastic hooks will do as long as these are not brittle and not very thin. Reliable soft cases for the AR15 are hard to find because most products in the market don’t meet quality, material and feature requirements of most AR15 owners. That’s why we put up our own research and found some of the best. Here they are. 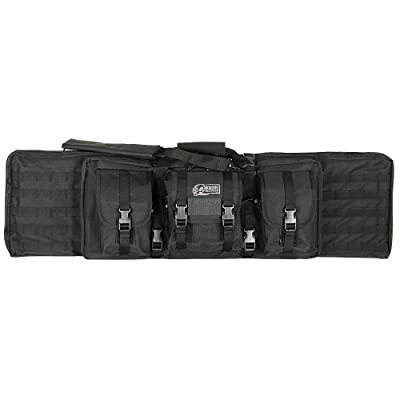 This American made Tactical Rifle Case is very new in the market. The company knows that it got a lot of competitions so they made this with a lot of good features. Measuring 36 inches long and 12.5 inches wide with five individual magazine pockets, each pocket has an adjustable Velcro flaps so that you can stuff in more than one magazine and other accessories for each pocket. This has a water resistant nylon outer shell and snag-proof flannel for the internal lining as well as 1-inch foam for total gear protection. So even you carry it under the rain or bump on rocks or trees with your rifle inside, this is totally protected. With web handles that let you have a strong, comfortable grip, it is also featured with a detachable nylon sling with swivel snap hooks so it sure is convenient and safe to carry ev it’s loaded. Tough outer shell made of water resistant nylon. Lining inside is made of soft and snag-proof flannel. Very spacious it could fit a 36” AR15 with scope. Wide zippered pocket for extra accessories. Webbing handles and nylon sling. Length – 36 inches, Width – 12.5 inches and 1” foam all over the interior. Full zipper to let you open all the way around. Warranty: Check warranty card or call customer service. Some users hope that this could be 4 to 5 inch longer to accommodate long rifles with large scopes. Condor has been manufacturing tactical vest, army backpacks and other products for the outdoor gear for decades. This is why this Condor Single Rifle case is also considered the best AR15 soft case with a military grade and style but very lightweight at only 1 pound when empty. It can accommodate rifles as long as 42 inches long with scope so an AR15 would surely fit perfectly. With ¾ -inch padding, your rifle will be safe even you bring it into the woods for a rugged hunting spree. To secure your things inside better, its interior’s first compartment is also featured with hook and loop straps so your rifle won’t jiggle inside it. The second compartment also has pockets where you can stuff your optics, magazines or pistols. The exterior, on the other hand, offers 3 large pouches with secured durable belted straps for extra mags, ammos and other things. With these straps, nothing will fall even the case tumbles. Comes in three colors: black, olive drab and tan. Made of tough woven fabric, sturdy, functional and water resistant. Three large external pouches are belted to totally secure magazines, ammos and other accessories. ¾ inch internal thick padding with loops and straps to ensure safety of the rifle and optics inside. 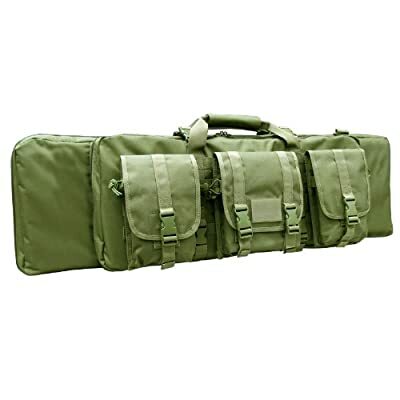 Has 2 internal compartments: 42 inches long compartment to accommodate long rifles and 36 inches compartment with pockets for optics, short firearms and other accessories. Very versatile, best choice among hunters. Warranty: Check manufacturer’s website or contact seller. This case has a lot to give. With a design that gives you the idea that you can put more to it than you can carry, this is actually a case that can carry two long guns and two handguns. Even its exterior pockets also have smaller pockets and are all secured with locking durable plastic belts. Made of rugged ballistic packed cloth, this case also has a self repairing military style zipper that is also lockable. Weighing only 8 pounds when empty, this can be your best AR15 soft case if you’ll be looking for a totally solid case for your long and short guns, ammos, accessories and more. If you want to carry your AR15 along with detachable upper and lower receivers plus an array of scopes in one tough soft case, this one will be of good use to you. Solid construction. Made with copolymer material and designed for extreme conditions. With three large lockable exterior pockets and extra pouches for each pocket. Internal 2-inch thick cell foam padding that is detachable. Self-repairing and lockable military style zippers. Wrap and carry velcroed handles and adjustable shoulder harness. Internal accessory pockets for ammos and accessories like flashlights, magazines and scopes. With a backpack-style strap to allow back-sling during hunting. With hook and loop straps to secure weapons. Becomes heavy once two rifles are loaded. 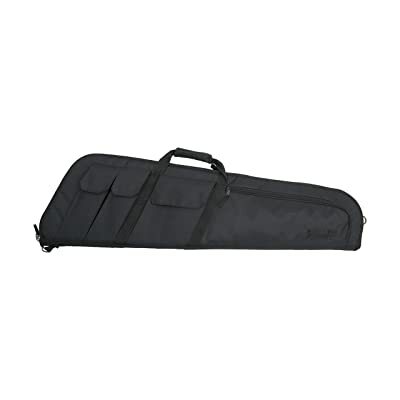 This tactical rifle case is seen by many law enforcement officers and civilian gun owners to be the best AR15 soft case to bring along. Whether you’re going to the firing range or for police to keep their guns in their car, this case has features that are really appreciable. First, the design is simple. There’s the interior that can accommodate a long rifle and a lockable padded zipper shield to protect the gun. Second, it has a strap system to keep the weapon firm in its place. Third, the external magazine pockets are too spacious you can carry a lot of magazines in it plus your accessories. They are also featured with Velcro locks so you can quickly draw your magazines without the need to unlock belts. Fourth, this weighs only 3 pounds if not loaded and the padded handle allows comfortable carry even if it’s packed with your gun and things. Lastly, it has a removable padded shoulder strap so if your hands are full, slinging the case to your shoulder becomes convenient. Simple, basic but of sturdy construction. Outer case is made of Endura fabric that makes it more durable. Internal component is loaded with thick padding for total firearm security. Three external adjustable pouches with Velcro locks that can accommodate magazines and accessories. One external large zippered pocket for scopes. With thick foam padding and internal soft knit lining. No internal strap to secure the rifle. Too short and small for a long rifle. Uncle Mike is also thought to be the best AR15 soft case in terms of simplicity but with enough functionality. It is also available in two sizes: 33”x10” medium size and 4”x10” large size case. This makes it easy for you to choose from these two options according to the length of your gun including its optics. Each size also has different number of pouches. The medium case presents three magazine pouches while the large one offers five magazine pouches. Both have hook and loop closures. Weighing only 2 pounds when empty, you can load your AR15 in it securely, plus magazines and accessories as well. With its full-length zipper, this allows you to spread open the case to give you full access to all your things inside. Most police personnel also prefer this case because it’s easy to carry, have very basic features and the let them have a quick access with the rifles and magazines which is crucial during operations. Comes in two sizes to accommodate different rifle length. Fully zippered to allow total access. With handy tab and loop system necessary in locking the case while open. Exterior pouches to store magazines and accessories. With simple snap carry handle and a removable shoulder strap. Internal 2-inch foam padding for utmost protection of things inside. Interior handgun pocket to complete your gun set. Zipper not heavy duty made. Straps and zipper not too durable according to some reviews. With all the fantastic features that these soft cases present I actually want them all. Made superbly to meet everyone’s criteria for their rifles and accessories, these are actually the best reviewed soft cases among the most popular products. 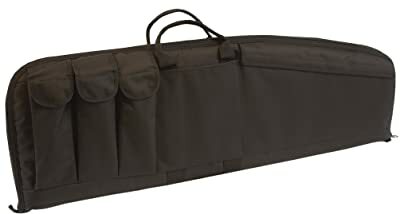 However, I really had a good liking on the Tactical Rifle Case because this is primarily made by American Mountain Supply. I can rely on it better in terms of durability, functionality, versatility and of course, its dimension enables me to carry a lot of gun paraphernalia along with my AR15. So for me, this is essentially my best AR15 soft case that meets my criteria.